to a unique respite from the outside world. Your bedroom is a haven of relaxation, recharging and reorientation that you can look forward to returning to every night. One of the most essential ingredients to the bedroom’s tranquil atmosphere is its lighting: A well-configured lighting setup can elevate a bedroom from simply a space to a veritable escape from the daily grind. There are certain nuances that come with every space, and the bedroom is no exception when it comes to lighting. Using layers of ambient, task and accent lighting with careful placement and dimming controls will have a great impact on the bedroom’s look and feel. 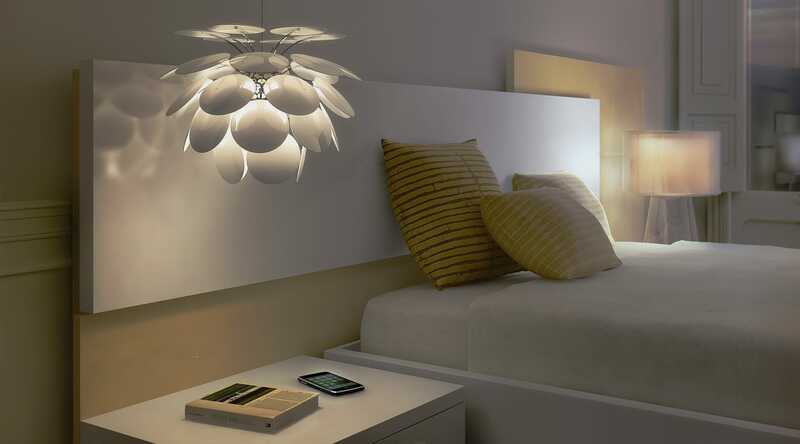 Ambient lighting, otherwise known as general lighting, is the foundation of a good bedroom lighting scheme. It provides soft light with a wide reach, illuminating the room at large with the help of natural light from windows and skylights. This makes it easy to see and perform simple tasks, without the harshness or directness of other forms of light. Ideal for dressing due to its similarity to the wide glow of natural sunlight, ambient light is most frequently provided by various forms of ceiling lamps, such as chandeliers, pendants and flushmounts. Floor lamps can also provide this type of light from unorthodox angles, giving you plenty of options in placement and visuals. For more focused tasks such as reading, grooming or working, task lights provide the bright and focused light to make those tasks possible. Desk lamps are a classic example of such a light, while table lamps, pendants and wall sconces allow customers to use this powerful type of lighting in various locations, such as on a bedside table. Of course, everyone’s needs vary, and those needs will determine what kind of task lighting you should get. Table lamps with light-colored shades are better for reading than those with dark shades, as a dark shade would dilute the light’s brightness. Swing-arm lights are good for focused reading, whereas more artistically designed table lights or even pendants create a more ambient and soothing atmosphere. After you’ve created a solid base with your ambient lights, and added task lights for the tasks you need them for, consider investing in some accent lights. These lights provide a soft, inviting glow similar to ambient lighting, creating both a cozy atmosphere and drawing attention to the area it’s placed in. Wall sconces, tape lights and recessed lighting are all equally suitable for adding attractive visual embellishment to your bedroom. Now that you’ve layered your bedroom lighting configuration, it’s time to look into an underappreciated but very important lighting accessory: the dimmer. For many people, going from a single bright light to complete darkness is too jarring of a transition to get to sleep easily. Dimmer switches allow for a more gradual change in lighting, not only making it easier to fall asleep, but also providing mood lighting as the day’s activities wind down. If you want to add a dimmer to a lighting configuration, you can rest assured that dimmers typically come with an easy installation process. The complicated part is figuring out which bulbs are compatible. Certain bulbs, such as Compact Fluorescent Lamps (CFLs) or low-voltage LEDs, are prone to flickering and buzzing when dimmed. Take extra care to find a dimmer that matches your bulb preference, and vice versa. Once that’s taken care of, a dimmer can be a great tool for making a comfortable space at all hours of the day. With all these disparate elements going into making good lighting for a bedroom, it can seem daunting even to figure out how to pick what style of light you’d like, let alone arrange them in the most aesthetically pleasing and functional way. It is true that some lights work particularly well in certain locations, or as complements to particular pieces of furniture. Task lamps provide not only utility, but the opportunity for a design element on your desk or bedside table. Accent lights spread sporadically across the wall or beside a chair can draw the eye to various points in your bedroom as well as the bed, taking the people who enter on a visual journey. And, of course, chandeliers provide dazzling visuals by themselves as well as through the light they present. The good news: It’s all up to you! Whether you’re looking for a spare, evenly lit setup, or you’d like to add artistic flair with carefully placed mood and accent lighting, there’s no wrong way to go about lighting your bedroom.